This feature length film is written, directed, DP’ed and edited by Brad Rego. A one man band with a firm grasp on horror and film history, Rego tells the story of a group of friends who decide to rent a cabin in a secluded forest for the weekend. They however, get more for their money than they expected when the one and only, Jacob Marr, seeks out the blood of these young campers. The story is presented to the audience in a strait-forward and easy to follow fashion. When learn of the childhood of Jacob Marr and the strange “encounter” he has as a young boy. We then flash forward in time to present day as we meet the ordinary college kids who are out looking for a good time at the cabin. Nothing new, but definitely nothing wrong with the premiss either. It’s a homage to the classics of the 80’s and I for one respect that. The film has some nice gore effects that are done on the cheap, but overall, they are very effective. The blood is realistic and the choice of on-screen deaths must be applauded. The main positive within this film is the acting. All of the actors were believable and had excellent line delivery. All too often with low budget films, the audience is forced to sit through a story being told by amateur actors who have obviously not taken the training required to sustain a feature film. So, I was pleasantly surprised by the performances found within “Jacon Marr.” The lead, Morgan White, doesn’t blow the top of the acting gauge, but I found him to come across as likable and believable in his role as Ted. Ted’s love interest, Claire, was played by the lovely Alyssa Mann. Mann had the strongest acting talent found in the film and was a breath of fresh air as a strong female character. Their good friend, Dan, was played by, Brandon Beilis, who was used as the comedic relief. His lines came across very smooth and was pigeon-holed as the “funny” guy from the start. The jokes didn’t always land, but that is no fault of Beilis. Other then the actors, the technical film aspects are still fairly well done. The dialogue within the script was well worded, however, the writing felt like it was reaching for the jokes from time to time. The cinematography had it’s moments, primarily at the opening with the lush green forest as a beautiful backdrop to the young Jacob Marr. The framing could have been improved during a shot here and there, but nothing too major. The one big downfall for this film is the length of the film itself. At 110 minutes, 20 to 30 minutes of “Jacob Marr” could easily be cut. Many of the scenes seem to drag on forever and other than the very beginning, the gore and scares are nowhere to be found until well later into the film. This is not always a bad thing to keep your “good stuff” until the end, but with a running time of 110 minutes, the audience gets a little antsy and starts to wonder, “When is something going to happen?” The gore at end tail end of the film is very well done and the effects team who worked on this film must be commended. With so much on his plate, Brad Rego is still able to produce a project to be proud of. However, I do stress to anyone making a film (Rego included) that it is of the utmost importance to remember that filmmaking is a collaborative art form. Taking on writing, directing, cinematography and editing is an epic task. Not only do you have way to much to focus on, but you do not get the perspectives of your peers as you would if the positions were handed out to different individuals. When creating a film, it is easy to have tunnel vision as one always looks toward to finished product. 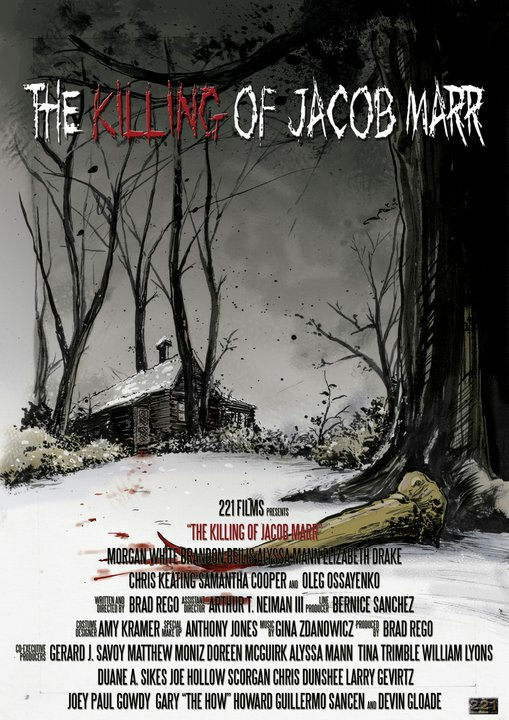 “The Killing Of Jacob Marr” is an interesting journey and one that is sure to receive much positive recognition. The acting is excellent and the characters are likable. As in any film, there are pros and cons, but I’m glad to say the in this one, the pros do indeed outweigh the cons.